This is a great opportunity to join a small, dynamic, and long established company, supplying a huge range of products, to an extremely diverse client base within the highly competitive field of promotional merchandise. Due to increased sales and expansion, a role has been created for a Full Time Trainee Sales Office Supervisor, to work alongside the current Sales Manager, generating new business and assisting with managing our small sales team. The long term objective of the post is to take over the position of the Sales Manager on her retirement – time frame unknown at present time. We are looking for a highly organised and flexible individual who is both self motivated and reliable, and has the ability to work without direct supervision. The role will be challenging and varied. Primary responsibilities will be sales and sales processing to both existing and new clients and therefore good communication skills and command of English, by phone or email, are essential. The candidate must be able to demonstrate good keyboard skills at a suitable word rate. The successful applicant will have a minimum of four years telesales and office administration experience and will possess a confident and outgoing telephone manner. Experience of client account handling and working within a small team are also essential attributes. Previous experience with sales based contact management systems would be an advantage, as would some basic financial accounting knowledge. This entry was posted in General on August 18, 2015 by nicky. 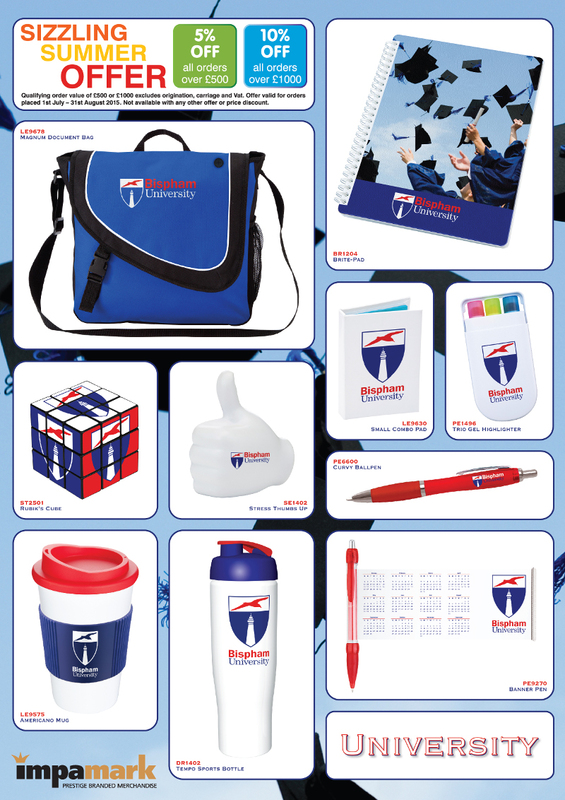 Upto 10% Discount on Freshers items ! This entry was posted in General and tagged Freshers, giveaways, Personalised Merchandise, personalised products, University on August 5, 2015 by nicky.